John R. Gaines, who built Gainesway Farm into one of the industry's leading stud farms and is credited with founding the Breeders' Cup, died Feb. 11 in a Lexington hospital from complications of diabetes. He was 76. Gaines envisioned a championship day of racing at a major track that would help sell the sport to the general public. He came up with a plan for seven races worth Usd 15,000,000 and televised nationally, with the money to come from owners, stallion owners, and breeders. One who quickly saw the benefits of the idea was Kenton Hollingswoth. "It would provide a reasonable basis for a man paying a high stud fee, bidding one million dollars for a yearling," wrote The Bloodhorse editor shortly after Gaines announced it in 1982. "It also would give a championship form to racing...It is an idea new to the Thoroughbred industry, a good idea, indeed." It took time and a concerted effort, but Gaines and several others worked out the kinks. The first Breeders' Cup, run in 1984 at Hollywood Park and worth Usd 10,000,000 instead of the suggested Usd 15,000,000, was a huge success. As time goes by, it is hard to imagine the sport without it. "His ideas were light years ahead of his contemporaries," said John Sikura, owner of Hill 'n' Dale Farms near Lexington. "You can cite so many things that he did: breeding to larger books, assigning bonus seasons, importing stallions to make them influential sires, and starting the Breeders' Cup. Not only was that his idea, he was selfless enough to step aside when acrimony developed. Not many original members did that. He was a bigger man than most." It was in the early 1960s when Gaines seriously set about the task of mastering the horse business. He spent three weeks in the University of Kentucky library in Lexington reading through all the bound copies of The Blood-Horse, starting with the May 11, 1929, issue. Bolstered by some family money and two years of studying animal husbandry and genetics at the University of Kentucky, Gaines started building a quality broodmare band and buying shares in prominent stallions prospect. What took some men decades to achieve, Gaines did in the proverbial blink of an eye. "In less than a year and a half, 35-year-old John R. Gaines, a third generation trotting horse man with enterprise, cash, and intelligence, deliberately set about and accomplished what many have thought improbable if not impossible," Hollingsworth wrote in 1964. Among the mares Gaines bought were multiple stakes winner Oil Royalty. Purchased in training in 1962, Oil Royalty won five stakes for Gaines, including the Beldame and Top Flight Handicap. Cosmah, another member of the group, proved extra special to Gaines. Cosmah's yearling daughter by Turn-to sold for Usd 140,000, the highest price of 1965, at the Keeneland July sale. At the 1968 Fasig-Tipton Saratoga sale, Cosmah's filly by Hail to Reason went for Usd 225,000, which at the time was the fourth-highest price ever paid for a yearling. Cosmah produced stake winners Halo and Fathers Image for Gaines. The former won several important stakes before becoming a leading stallion, siring Kentucky Derby (Gr.1) winners Sunday Silence and Sunny's Halo. Horse of the Year in 1989, Sunday Silence embarked on a record-shattering stallion career in Japan. Another of Cosmah's daughters bred by Gaines, Queen Sucree (by Ribot), became the dam of 1974 Kentucky Derby winner Cannonade, who raced as a homebred for John Olin. Gaines stood Cannonade's sire, Bold Bidder, at Gainesway. Cosmah was named the 1974 Kentucky Broodmare of the Year, and the plaque Gaines received for her accomplishment was always prominently displayed in his office. Cannonade's victory made good on a promise Gaines had made to Olin five years previously. It came after one of Gaine's early mentors, John Hanes, recommended that Olin retain Gaines for all his bloodstock matters. Gaines shared the details of the meeting when he was the honored guest at the Thoroughbred Club of America dinner in 1991. "Mr. Olin told me that John Hanes had told him that within the next five years I would see that he won the Kentucky Derby," Gaines told the audience. "He demanded in his gruff fashion, but with a twinkle in his eye, 'Can you guarantee me that this will happen if I turn my affairs to you.' I looked him straight in the eye and said, 'Mr. Olin, has Mr. Hanes ever told you anything that wasn't true?'" Gaines, Olin, and Hanes had done business years earlier with the purchase of Bold Bidder. Bought for Usd 600,000 in late 1965, Bold Bidder was co-champion older male the following year. Five years after Cannonade's classic score, Bold Bidder added another Derby winner to his resume when his son Spectacular Bid, captured the 1979 running. Born Nov. 22, 1928, near Sherburne, N.Y., Gaines took over a Standardbred operation begun in 1925 by his grandfather, Thomas Gaines, and nurtured lated by his father, Clarence Gaines. His grandfather ran a feed business, and his father developed Gaines Dog Food, which was sold to General Foods in 1956. The family moved the Standardbred operation from New York to Lexington in 1944 at what now is known as Gainesway subdivision. John Gaines, whose Standardbred champions Kerry Way and Speedy Streak were Hambletonian winners, started the Thoroughbred division of Gainesway Farm in the early of 1960s at a farm close to Keeneland. Gaines moved the operation a decade later after buying half of the C.V. Whitney Farm on the other side of town. Bold Bidder and the rest of the stallions made the move to their new home in 1973. With Gaines from the early days was Marion Gross, who stayed with Gainesway after the farm was sold to South African Graham Beck in 1989. "I learned a lot of from him, and he couldn't have been better to me," said Gross, who serves as stallion manager. "He was the type of guy who could look six months down the road and see what business was going to be like and what he needed to do." 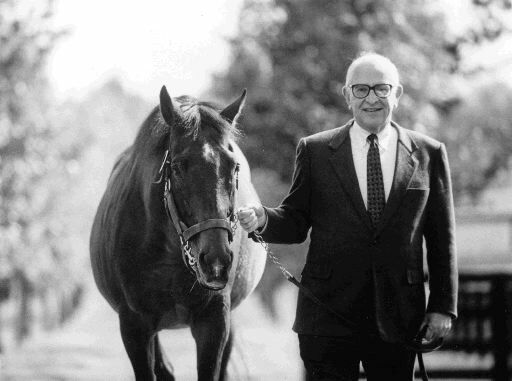 Graham Beck's son, Gainesway president Antony Beck, recalled that "John Gaines had tremendous vision and did so much for the horse industry he loved. He was forever dedicated to this industry and, through KEEP (Kentucky Equine Education Project), maintained his involvement even in his latter years. He had tremendous intellect and was a genuinely unique and special person. I feel fortunate to have had the opportunity to spend time with him and get to know him." Gaines emphasized the stallion end of the business, never owning more than 15 broodmares, but standing close to 50 stallions at times. He helped change breeding patterns by introducing more prominent European runners to the North American market that any one man. He acquired, stood, managed, and syndicated such major stallions as Lyphard, Riverman, Blushing Groom, Green Dancer, Irish River, Sharpen Up, and Vaguely Noble, all of which were champions and/or major winners in Europe. Under Gaine's direction, Vaguely Noble became the first truly great international stallion, siring such stars as Dahlia, Exceller, Lemhi Gold, Empery, Estrapade, etc... Among the others to stand at Gainesway were Icecapade (sire of inaugural Breeders' Cup Classic, winner Wild Again), Dust Commander, Master Derby, and Youth. Present day Gainesway stars Broad Brush, Cozzene and Mt. Livermore began their stallion careers at Gainesway when Gaines owned the farm. Gainesway was one of the first farms to star multiple breeding sessions per day and had success with putting mares under lights before many farms began the practice. For many years, Gainesway's manager was Joe Taylor, who died in December 2003. One of the Taylor's sons, Duncan Taylor, remembered Gaines as a generous man. "Dad always spoke highly of him," said Taylor, who operates Taylor Made Farm near Nicholasville, Ky., with family members. "He was a good man to work for, and Dad never had to ask him for a raise. He gave Dad the freedom to do other things, like raising tobacco." "When Mike Shannon and I started the farm (Taylor Made), we didn't have much more than a pitchfork and three buckets. Mr. Gaines and my dad referred some clients' mares to us. Mr. Gaines provided us with a great opportunity." Bloodstock agent James Keogh, who worked at Gainesway in the 1980s, learned valuable lessons from Gaines. "He could get people to excel and got you to go beyond what you felt you accomplish," Keogh said. "He always tried to find a better way." Gaines also counseled Keogh about the aspects of monetary bravery. "I talked to him about going out on my own, and he said there's a big difference between taking a commision (buying a horse with someone else's money) and buying a horse with your own money." Just a few years after selling the farm, Gaines re-entered the business, though on a completely different level. He started buying mares, and quickly owned more than 100. He was joined in the operation of John R. Gaines Thoroughbreds by his son, Thomas, and daughter, Gloria, with the enterprise managed by Olin Gentry. Gaines sold the company in 2000, and it now operated as Gaines-Gentry. Gainesway had been a leading yearling consignor for many years to the Keeneland and Saratoga sales, but John R. Gaines Thoroughbreds sold its entire crop each year as weanlings. Gaines was a founder of the National Thoroughbred Association, which later morphed into the National Thoroughbred Racing Association. He was also instrumental in the founding of the Kentucky Horse Park and Maxwell H. Gluck Center for Equine Research at the University of Kentucky. A reception room at the Horse Park is named the John Gaines Room. He was the founder of The Gaines Center for the Humanities at the University of Kentucky. For his contribution to English racing, Gaines received the Duke of Devonshire Award for improving English breeding and racing, and the Lord Derby Award. He worked with such renowned owners as Khalid Abdullah, Nelson Bunker Hunt, the Aga Khan, John Magnier, Stavros Niarchos, Robert J. Kleberg Jr., Daniel Wildenstein and E.P. Taylor. "John Gaines was probably the greatest independent thinker in the bloodstock business in modern times," said Magnier of Coolmore Stud. "Highly intelligent, articulate, and possessed with great business acumen. He was very generous with his advice, which always well worth heeding, and he had that unique ability to be able to think outside the box." Always known as a philanthropist, Gaines and his wife, Joan - the two were married in 1959 - were the chairs or cochairs of fund drives that raised more than Usd 100,000,000 for education, arts and sciences, and religion. Gaines, who was awarded an Eclipse Award of Merit and received the Breeders' Cup Special Award, was fascinated by genetics. He was asked in a question and answer with The Blood-Horse in 1999: What are the most important factors to breeding success? "Everything in breeding and racing is a matter of understanding the probablilities and getting the probabilities working for you instead of against you. In genetics it is the progeny test and in the enviroment it is the transcendent trainer." In the same interview, Gaines was asked: What is it about Thoroughbred racing and breeding that has kept your attention all these years? "It is a legacy handed down to me by my grandfather, my father, and by me to my two children. We all have an ownership in John R. Gaines Thoroughbreds, and I am happy to say there is an unbroken continuity for four generations now of a shared love of the Thoroughbred." "Breeding Thoroughbred horses is the greatest challenge in animal husbandry, because you are breeding for highly elusive intangibles like speed, stamina, soundness, and courage. I have also discovered in my lived experience that you cannot have sporting success unless you have economic success. Improving the breed, and at the same time improving you pocketbook, is the best of all words." Gaines loved the arts and for many years collected pieces of artwork. He was a director of the National Gallery of Art in Washington. Gaines sold part of his collection at Sotheby's in 1986 and the 46 drawings brought Usd 21,280,000 million. Included was Leonardo da Vinci's 'Child with a Lamb' which sold for Usd 3,600,000. Gaines received an A.B. degree in England from Notre Dame in 1951 and an A.B. in genetics from the University of Kentucky in 1953. He served as an intelligence officer in the Pentagon until 1956. "He had an immense intellectual curiosity and capacity for learning, which made him, among other things, an expert in fields as diverse as art, literature, architecture, genetics, farming, and politics," said D.G. Van Clief Jr., commisioner of the NTRA and a founding member of the Breeders' Cup management team. "John also was a great market timer. He knew when to buy or sell, and that include launching his own ideas." "Above all, he was a believer in the power of ideas. Locally, he'll also be remembered for his contribution to the creation of the new University of Kentucky Library and, most recently, for his instrumental role in the founding of the Kentucky Equine Educational Project, which like so many of his contributions, will likely be an important influence for years to come and like the Breeders' Cup, will undoubtedly be emulated widely." James E. (Ted) Bassett III, chairman emeritus of Keeneland Association and retired president of the Breeders' Cup, said of Gaines: "While John Gaines has been the inspiration and catalyst for numerous individual projects, as well as philanthropic contributions to the fields of art and education, he may be remembered more for his restless mentality and intellectual curiosity which challenged the status quo and the unproven, frequently to the bane of his peers." Gaines raced only a handful of stakes winners, but bred more than 50 added-money winners alone and in partnership. Gaines' personal recollections will make their way into print. From February of 2003 through May of 2004, University of Kentucky historic preservation professor Dr. Dennis Domer spent dozen of hours interviewing Gaines for material for a book about him. He came away highly impressed. "My staff and I found him brilliant, articulate, tough-minded, generous, sweet, and shrewd. We really loved him," Domer said. "He was the symbol of breeding the last 25 years. Mr. Gaines wanted his book titled 'The time of My Life.'" Gaines, who also was a major benefactor of the Catholic Newman Center in Lexington, is survived by his wife and two children. "Conventional wisdom will tell you that the breed is not as sound today as it was 30 years ago, 50 years ago, and 75 years ago. Conventinal wisdom is almost never right"
"It is the condition of racing that determines the soundness of the breed. There is no such thing as an index of soundness and there is no agreed upon definition of what soundness means"
"Since the Thoroughbred does nor reach his full physical maturity until 4 years an a half of age, soundness is always going to be a major problem. The unreasonable physical demands that are placed upon young, immature, undeveloped horses are going to cause all kinds of breakdowns, injuries, physical trauma, and mental problems." "No ne is forced to stand any stallions they do not want to stand. Speed, precocity, stamina, and soundness are convenient buzzwords, but they are not mutually exclusive concepts. A horse can have soundness and precocity as well as speed and stamina. The conditions of racing determine the shape of the breed"
"I once asked Bull Hancock the question, 'If your fairy godmother came out of the sky and said, Bull, I'll grant you one of three wishes. Would you rather have Bull Lea, the 20 best mares at Calumet, or Ben Jones? Which would you take?' He said, 'That would easy: I'll tale Bull Lea.' And he said, 'What would you make?' I said I would take Ben Jones. Because there are just a few transcendent trainers. And, they are so important... Breeders only want to think in terms of genetics, but the transcendent trainers like Ben Jones, Hirsch Jacobs, Woody Stephens, and now Bob Baffert or Wayne Lukas, are worth as much as a great stallion or a great broodmare"
"There is no such thing as having too narrow a gene pool. Stallions only provide 50% of the genes to any individual animal and the broodmare, of course, provides the other 50%. Geneticists call this Galton's Law and it is one of the fundamental, indeed immutable principles of how animals inherit. Any permutation of Galton's Law is without merit and is errant romantic nonsense"
"There is no question whatsoever - the greatest single threat to continued growth is the anti-gambling sentiment throughout the country. Thoroughbred racing is a very small part of the gambling industry. If we are not politically strong, well organized, and adequately financed, we will not have any influence or control over our future"
"I also learned from these influential mentors and from my own lived experience that scientific truth is not always economic truth. There is only a handful of people in racing that have an elementary understanding of genetics, how animals inherit, and scientific probabilities. The mythology surrounding the breeding of Thoroughbred is pervasive. A few of these myths are the astonishing stupidity of the dosage system, the absurd overemphasis on the female family, and the irrational belief in the validity of nicks"
"The big issue is, that while there are all of these statistics, these pedigree nerds, the people that are promulgating all of this scientific nonsense, there is never any control group. It is all selective, self-serving, worked-over information. I did a study one time with Dewey Steele about nicks, and we found the worst horses, those finishing last at Thistledown and Charles Town, had the same nicks as the horses that were winning the classics. One of the dumbest things that's done is that they take an infinitesimal sample of maybe three or four or five horses and pompously say that is a nick. From my scientific point of view, a sample that is that minuscule is wortless. Millions and millions of dollars are spent every year (on horses), yet a high school freshman that is taking an elementary genetics course has a better understanding than someone who is spending a hundred million dollars a year and is listening to all these charlatans who are promoting genetical lies"
"When you have neglected your customer base for 50 years you cannot expect to renew this base in five years. The industry needs to have an undeviating commitment to the NTRA over a period of time and not expect instant results"
"Vincent Van Gogh said the best way to know life is to love many things. I am just starting to know life, but I am running out of time. I am the most fortunate of men because I have had many of my dreams come true and I am still dreaming and I am still working. I enjoy playing the game, particularly the horse game."